2 of 4 Combine olive oil, shallot and garlic in bottom of slow cooker. Combine flour, salt and black pepper; coat chicken with mixture and add to slow cooker. 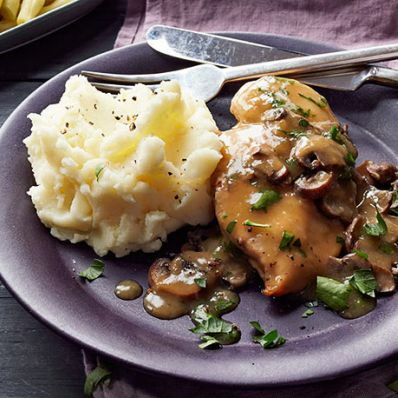 Scatter mushrooms over chicken and add Marsala. 3 of 4 Cover and cook on LOW for 4 hours. Drain liquid into a small saucepan and bring to a simmer. Combine cornstarch with 2 tsp water and stir into saucepan; simmer for 1 minute and add back into slow cooker. Stir in parsley. 4 of 4 Serve chicken with sauce and, if desired, mashed potatoes and yellow beans.